Anna Gambucci’s husband called her one fateful July morning in 2008 to say, ‘This might get me in trouble, but you have to turn on Minnesota Public Radio.’ Anna immediately listened to an interview of Jessica DeGroot and Francine Deutch, discussing ways some husbands and wives were more equitably ‘sharing the load’ of work and family. It was a life changing moment. Anna immediately contacted Jessica Degroot to learn more about ways to creatively address and increase gender equity and satisfaction in family life—for herself, and eventually for others. Anna has been an active participant in the ThirdPath community ever since. 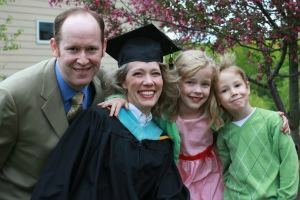 Anna has a Masters of education in Family Education from the University of Minnesota. Her Masters course work had the immediate benefit of helping her and her husband shift away from some more traditional roles and responsibilities. Now that their youngest child has started school, Anna and her husband are even more actively redesigning their Shared Care solution. Anna is looking for ways feminism, egalitarian family structures, and a commitment on the part of both parents to be primary care-givers to their children in the early years (and beyond), can be practical, and can positively impact quality of family relationships and quality of life for all. Anna is currently a member and co-facilitator for one of ThirdPath’s ILA learning groups. She also is working with ThirdPath to build connections with family advocacy stakeholders in Minnesota, and recently introduced the ThirdPath Shared Care concept at an annual conference sponsored by Minnesota Council on Family Relations. Anna also participates weekly in a ThirdPath peer support group where she and two other ILAs talk, listen, and support one other around their personal and professional goals.